Rolling Video Games of Chicagoland brings our amazing video game truck to parties in and around the Chicago area. 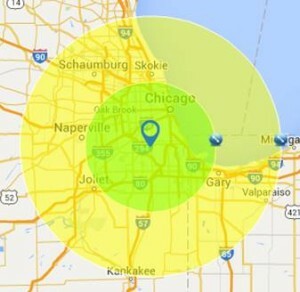 We service a radius of 50 miles from Oak Lawn, Illinois (zip 60453). The map below represents our Primary Service Area (30 mile distance from 60453) in green shading, and our Secondary Service Area (30-50 miles from 60453) in yellow. We assess a Travel Surcharge for parties beyond 30 miles. See chart below map. Distances in service area regions may not be exact. Use this handy application to calculate your distance from us. Just enter your zip code, and use the “Driving Distance” shown rather than the “Point to Point” distance. Don’t see your town or city listed? 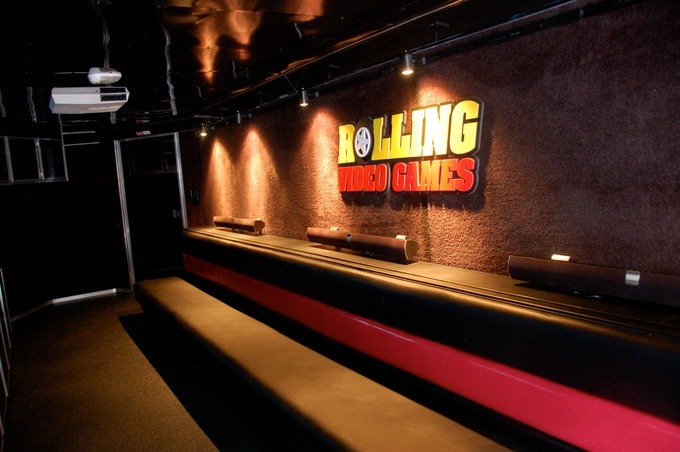 Contact us to see if we can service you before booking any party. Addison, Alsip, Antioch, Arlington Heights, Aurora, Bannockburn, Barrington, Barrington Hills, Bartlett, Batavia, Beach Park, Bedford Park, Beecher, Bellwood, Bensenville, Berkeley, Berwyn, Bloomingdale, Blue Island, Bolingbrook, Braceville, Braidwood, Bridgeview, Broadview, Brookfield, Buffalo Grove, Burbank, Burnham, Burr Ridge, Calumet City, Calumet Park, Carbon Hill, Carol Stream, Channahon, Chicago Heights, Chicago Ridge, Cicero, Clarendon Hills, Coal City, Country Club Hills, Countryside, Crest Hill, Crestwood, Crete, Darien, Deer Park, Deerfield, Des Plaines, Diamond, Dixmoor, Dolton, Downers Grove, Dwight, East Brooklyn, East Dundee, East Hazel Crest, Elgin, Elk Grove Village, Elmhurst, Elmwood Park, Elwood, Evanston, Evergreen Park, Flossmoor, Ford Heights, Forest Park, Forest View, Fox Lake, Fox River Grove, Frankfort, Frankfort, Franklin Park, Gardner, Glen Ellyn, Glencoe, Glendale Heights, Glenview, Glenwood, Godley, Golf, Grayslake, Green Oaks, Gurnee, Hainesville, Hanover Park, Harvey, Harwood Heights, Hawthorn Woods, Hazel Crest, Hickory Hills, Highland Park, Highwood, Hillside, Hinsdale, Hodgkins, Hoffman Estates, Homer Glen, Hometown, Homewood, Indian Creek, Indian Head Park, Inverness, Island Lake, Itasca, Joliet, Justice, Kenilworth, Kildeer, Kinsman, La Grange, La Grange Park, Lake Barrington, Lake Bluff, Lake Forest, Lake Villa, Lake Zurich, Lakemoor, Lansing, Lemont, Libertyville, Lincolnshire, Lincolnwood, Lindenhurst, Lisle, Lockport, Lombard, Long Grove, Lynwood, Lyons, Manhattan, Markham, Matteson, Maywood, Mazon, McCook, Melrose Park, Merrionette Park, Mettawa, Midlothian, Minooka, Mokena, Monee, Morris, Morton Grove, Mount Prospect, Mundelein, Naperville, New Lenox, Niles, Norridge, North Barrington, North Chicago, North Riverside, Northbrook, Northfield, Northlake, Oak Brook, Oak Forest, Oak Lawn, Oak Park, Oakbrook Terrace, Old Mill Creek, Olympia Fields, Orland Hills, Orland Park, Palatine, Palos Heights, Palos Hills, Palos Park, Park City, Park Forest, Park Ridge, Peotone, Phoenix, Plainfield, Port Barrington, Posen, Prospect Heights, Richton Park, River Forest, River Grove, Riverdale, Riverside, Riverwoods, Robbins, Rockdale, Rolling Meadows, Romeoville, Roselle, Rosemont, Round Lake, Round Lake Beach, Round Lake Heights, Round Lake Park, Sauk Village, Schaumburg, Schiller Park, Seneca, Shorewood, Skokie, South Barrington, South Chicago Heights, South Holland, South Wilmington, St. Charles, Steger, Stickney, Stone Park, Streamwood, Summit, Symerton, Third Lake, Thornton, Tinley Park, Tower Lakes, University Park, Vernon Hills, Verona, Villa Park, Volo, Wadsworth, Warrenville, Wauconda, Waukegan, Wayne, West Chicago, Westchester, Western Springs, Westmont, Wheaton, Wheeling, Willow Springs, Willowbrook, Wilmette, Wilmington, Winfield, Winnetka, Winthrop Harbor, Wood Dale, Woodridge, Worth, Zion. We also serve Crown Point, East Chicago, Gary, Hammond, Hobart, Lake Station, Portage, Valparaiso and Whiting. We assess a Travel Surcharge for events beyond 30 miles of 60453 (Oak Lawn). 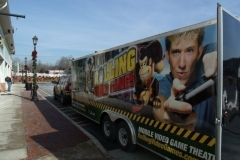 Chicago’s ULTIMATE Video Gaming Truck! 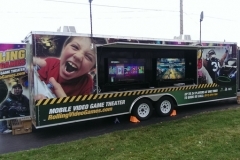 Our amazing mobile video game truck comes right to your curb or driveway! Forget about boring birthdays! Our parties are different...We Set Up...We Clean Up! Everybody has a BLAST, you get to RELAX, and best of all, your house stays CLEAN! - Check Availability and Book your Party. 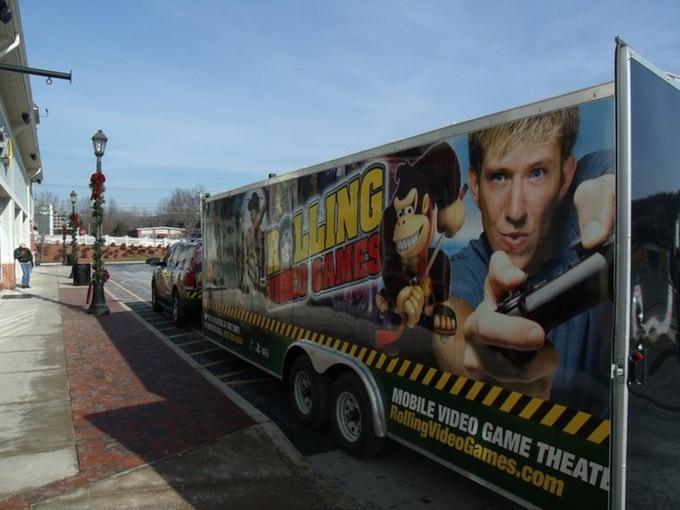 - Our Game Theater arrives early to set up. - Your guests will be amazed when they arrive! 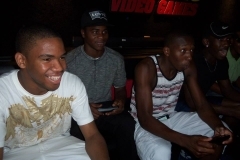 - You'll relax while they have a BLAST! 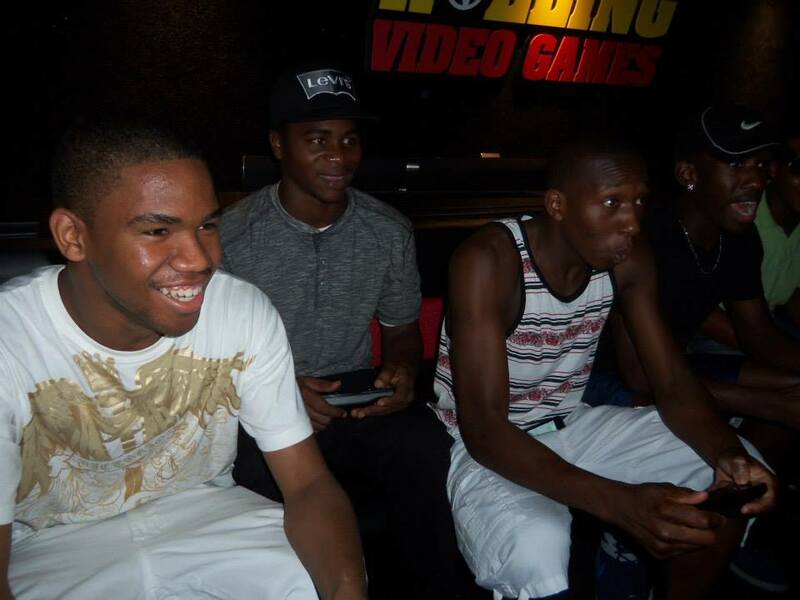 - Our Game Coach runs the party. - Your home stays clean!